I’ve begun gathering souvenirs to bring back to Vermont from Ortigia. Not the usual tee shirt or piece of pottery, rather souvenirs in the form of memories of Sicilian food – some simple, others complex, some easy to recreate and others impossible. The glass of blood orange juice that Charles makes for me with four fresh Tarocco oranges is my favorite way to start the day. Tarocco oranges grow in the fertile soil surrounding Mount Etna. They are sweet, less acidic than other oranges and have the highest vitamin C content of any orange variety grown. The juice is orange in name only, it varies in color from peachy pink to rose dore to nearly garnet red. I love it freshly squeezed and thick with pulp. Although there are blood oranges in the markets in Vermont, I’ll miss watching the sun shimmer on the Ionian sea as I sip the sweet juice. 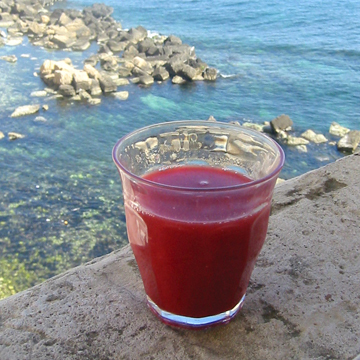 Unfortunately, blood orange juice at the edge of the Ionian Sea must be put into the impossible to recreate category. Salt cured capers are sold by weight at the market. They are about the size of lentils and have a sharp and sour taste that is lovely with chicken or fish and are a crucial ingredient in the tomato/potato salad I tasted on a recent trip to Marsala. Although it isn’t easy to find salt-cured capers in Vermont, there are jars of vinegar-cured capers in the pickle aisle of every grocery store. Here’s how I made the tomato/potato salad when we got back to Ortigia. I peeled and cut into one-inch chunks, five new potatoes that had been steamed until they were tender. I added three medium tomatoes that had been seeded and cut into chunks, two thinly sliced green onions, one tablespoon of roughly chopped, salt-cured capers that had been soaked in cold water, rinsed and drained, two tablespoons of chopped flat leaf parsley, three tablespoons of olive oil, two tablespoons of red wine vinegar, three grinds of sea salt and five grinds of black pepper to the still warm potatoes. With a jar of vinegar cured capers from the market this souvenir goes into the can be recreated category. I don’t remember when Italian flat leaf parsley won a place in my heart and kitchen. 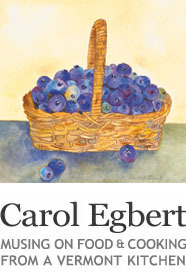 It might have been when I planted my first herb garden or perhaps it was when Fiorina Paci, my older son’s Italian great-grandmother, combined it with garlic and green beans from her garden. However it happened, the good news is that this tasty herb is available year round, in the produce department of nearly every grocery store, generally next to its curly leafed cousin. I use it in Sicily and in Vermont to flavor vegetables, chicken, fish, beans, and grain and rice salads. Seasoning with Italian flat leaf parsley definitely has a place in the can be recreated category. Download and print tomato potato recipe with an ingredients list here. I had my first glass of blood orange juice in the mountain village of Lavigno in the Italian Alps (I’ll never forget). Yesterday our little market here in Waitsfield (VT) just received a shipment and I was thrilled to take some home to squeeze. I gathered up a handful then put them back. Somehow, I knew it wouldn’t be same. I will enjoy a glass of ice cold maple sap water from the tree out back and dream of far away exotic places. Nice posts, thank you. How did you ever land a trip to Sicillian coast for weeks on end? This all sounds like heaven on earth!